Omar Berrada is a writer and curator, and the director of Dar al-Ma’mûn, a library and artists residency in Marrakech. 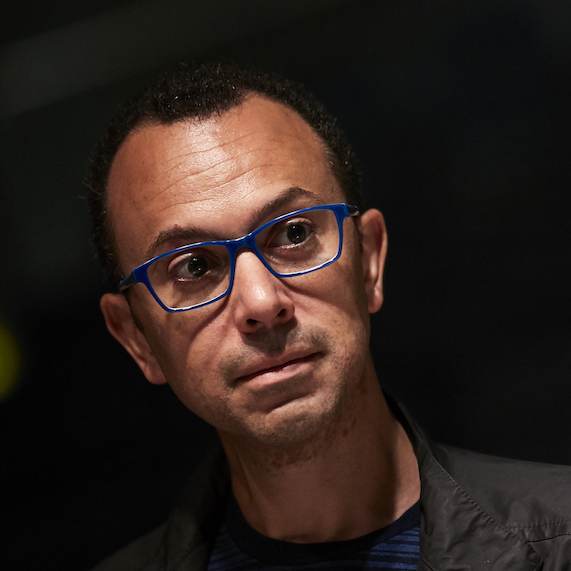 Previously, he organized public programs at Centre Pompidou, hosted shows on French national radio, ran Tangier’s International Book Salon, and co-directed Dubai’s Global Art Forum. He is editor, with Erik Bullot, of Expanded Translation – A Treason Treatise, a book of verbal and visual betrayals; and, with Yto Barrada, of Album – Cinémathèque de Tanger, a multilingual volume about film in Tangier and Tangier on film. His translations include books by Jalal Toufic, Stanley Cavell and Joan Retallack. His poetry was published in Wave Composition, Asymptote, Seedings, and the University of California Book of North African Literature, among others. He recently edited The Africans, a book on migration and racial politics in Morocco, and curated ‘Black Hands’, a solo show of M’barek Bouhchichi’s work at Kulte Gallery in Rabat. In 2016 he curated exhibitions at the Marrakech Biennale and at Witte de With in Rotterdam, centering on the work and archive of writer and filmmaker Ahmed Bouanani, whose posthumous history of Moroccan cinema he is currently editing. In 2017 Omar was the guest curator of the Abraaj Group Art Prize and a co-editor of Sharjah Biennial’s web journal tamawuj.org. He curated the 2018 editions of the 1-54 Forum, in New York and Marrakech. Currently living in New York, he teaches at The Cooper Union where he co-organizes the IDS Lecture Series.